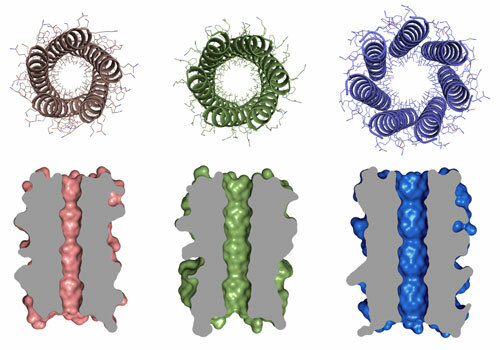 (Nanowerk News) Designer proteins that expand on nature's own repertoire, created by a team of chemists and biochemists from the University of Bristol, are described in a paper published this week in Science ("Computational design of water-soluble α-helical barrels"). A BBSRC-funded team from Bristol's School of Chemistry and School of Biochemistry, headed by Professor Dek Woolfson, have addressed this by designing manmade protein molecules from scratch. It is part of the growing effort in the new field of synthetic biology at the University of Bristol, which has recently been awarded £13.5M to establish BrisSynBio, a BBSRC/EPSRC-funded Synthetic Biology Research Centre.